Trump’s economic consultant adviser, Gary Cohn, has declared a return to the separation system in the US banking system in effect restoring Glass-Steagall Act which dates from the 1930s and was adopted as a result of the Great Depression yet abolished in 1999 by the Clintons. Trump had already spoken during the election campaign for a new version of the Glass-Steagall Act. So Cohn is simply repeating this position. Yet we have to look deeper here. 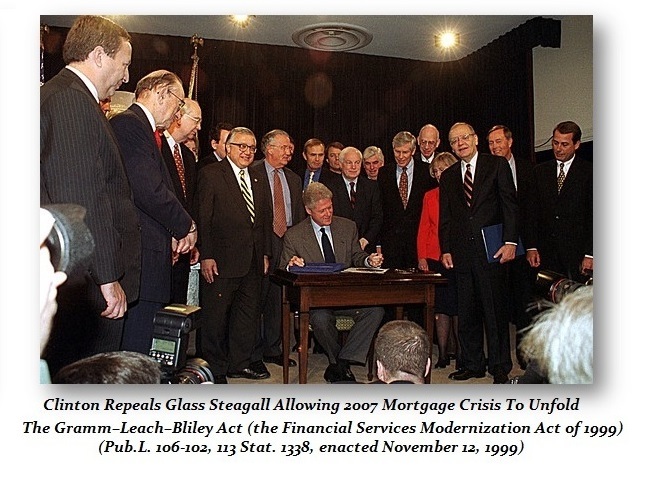 Why is a former Goldman Sachs guy now against the Glass-Steagall Act? In the banking sector, restoring the Glass-Steagall Act will reduce competition for Goldman Sachs. JPMorgan Chase, Bank of America and Citigroup would all be cut-off from investment banking services. Goldman Sachs and Morgan Stanley would be benefactors. Expect now that Congress will drag its feet to protect the banks making sure this will not take place in the short-term. Much of the argument focuses on reducing the size of banks and separating the powers between investment and commercial banking will prevent the too-big to fail problems.